Last week I read a column by Timothy Egan about books by J. D. Vance and Tara Westover, which he said were "guides to a Trumpland that is terra incognita to most Americans." Vance grew up in southern Ohio and Westover grew up in Idaho. A couple of days later, I read a column by Jill Abramson saying that reporters should "report the story from the places where the pro-Trump and Trump-curious live." She didn't say precisely where those were, but referred to the "heartland" and "rural America." These reminded me of an observation I have made before, which is that you don't have to travel all that far to find places where most people voted for Trump, even if you live in Manhattan or Washington, DC. (There are parts of the country where you have to travel a long way to find places where most people voted for Clinton--see this map). 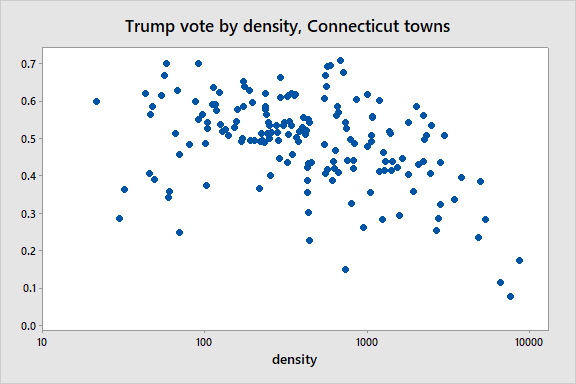 For example, Connecticut is divided into 169 towns: Trump got more votes than Clinton in 81 of those. He won some of them by big margins, getting as much as 68% of the vote (see the map of election results here). What sort of places were they? They tended to be more rural: here is a scatterplot of Republican share of the two-party vote by population density. 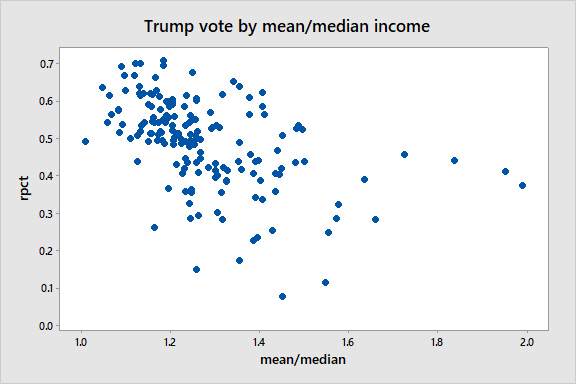 Mean divided by median is a measure of skewness, but given the typical distribution of income, it could also be regarded as a measure of inequality--that is, Republican support was lower in places with a bigger gap between the top and the middle. I'm not sure what to make of this relationship, but it seems potentially interesting. In most accounts, urban/rural differences in Republican support are treated as a matter of economics: rural areas are falling behind, and therefore people feel angry. 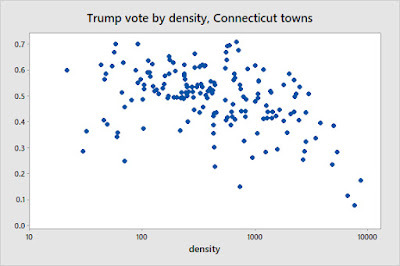 But Connecticut towns are small, averaging only 25 square miles. Also, even the biggest metropolitan areas in Connecticut aren't all that big. So regardless of where you work, you are in reasonable commuting distance of urban, suburban, or rural places. This point suggests that the urban/rural differences are mostly about preferences--the sort of people who decide to live in low-density areas are the sort of people who vote Republican. This possibility has sometimes been noted, but it hasn't received much attention. I think that's because of the tendency represented by Egan and Abramson--exaggerating the geographical distance between "red" and "blue" America. (I think they also exaggerate the social distance, but that's a topic for another post).